Which States Lead the Nation Nominating Women for Governor? With the 2018 primary season all wrapped up, the impressive tallies of women nominated for prominent political offices are now complete. Smart Politics reported earlier this month that despite a record number of women receiving major party U.S. Senate nominations (and a record number of matchups between two women), it is plausible there will be fewer women in the chamber next January than during the current 115th Congress. In state politics, women also shattered the mark for the most major party nominations received in gubernatorial contests with 16. That tally includes four incumbents: Republicans Kay Ivey of Alabama and Kim Reynolds of Iowa and Democrats Kate Brown of Oregon and Gina Raimondo of Rhode Island. 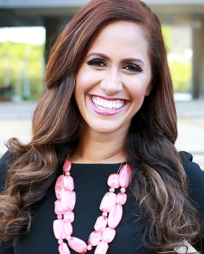 The 12 remaining challengers or candidates in open seat races are Republicans Andria Tupola of Hawaii (pictured at top) and Kristi Noem of South Dakota plus Democrats Stacey Abrams of Georgia, Paulette Jordan of Idaho, Laura Kelly of Kansas, Janet Mills of Maine, Gretchen Whitmer of Michigan, Molly Kelly of New Hampshire, Michelle Lujan Grisham of New Mexico, Lupe Valdez of Texas, Christine Hallquist of Vermont, and Mary Throne of Wyoming. The previous high water mark of 10 major party nods for the office had been set in four previous cycles – 1998, 2002, 2006, and 2010. Two states nominated women for governor for the first time this year – Georgia (Abrams) and Idaho (Jordan) – and three additional states could see women get elected to the office for the first time: Iowa, Maine, and South Dakota. Since 1924 – when the first two women were elected governor (Ma Ferguson of Texas and Nellie Tayloe Ross of Wyoming) – women have received 139 gubernatorial nominations by major parties (including the 2018 cycle) and have won 48 times. 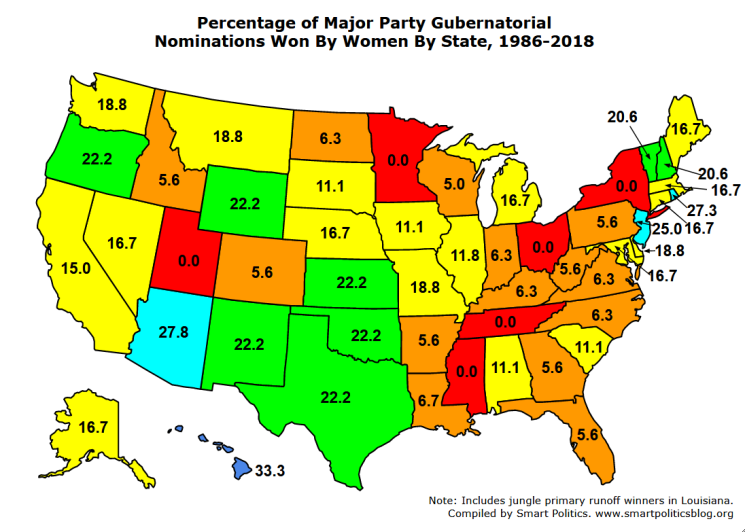 But there still are six states where major parties have never nominated a woman for governor: Minnesota, Mississippi, New York, Ohio, Tennessee, and Utah. [That number was 10 heading into the 2014 cycle when South Dakota and Wisconsin fell off the list]. Twelve states have nominated a woman just once: Arkansas (Jimmie Lou Fisher, 2002), Colorado (Gail Schoettler, 1998), Florida (Alex Sink, 2010), Georgia (Abrams, 2018), Idaho (Jordan, 2018), Indiana (Jill Long Thompson, 2008), Louisiana (Kathleen Blanco, 2003), North Carolina (Beverly Perdue, 2008), Pennsylvania (Barbara Hafer, 1990), Virginia (Mary Sue Terry, 1993), West Virginia (Charlotte Pritt, 1996), and Wisconsin (Mary Burke, 2014). [In Louisiana, Blanco was not nominated but emerged from the state’s jungle primary to win the 2003 general election]. Vermont and New Hampshire (the two remaining states that hold elections for governor every two years) lead the nation with women nominated by major parties to the office 10 and seven times respectively. The two major parties have done so six times in four states (Arizona, Hawaii, Rhode Island, Wyoming) and five times in two others (Connecticut, Texas). Looking at the data since 1986 – the first cycle when more than three women were nominated – finds western and northeastern states leading the way. [Eight women were nominated in 1986 – a number that held fairly constant through the next seven midterms: eight in 1990, nine in 1994, 10 in 1998, 2002, 2006, and 2010, and nine in 2014]. Over the last 32 years, women have received 40 of the 230 Democratic and Republican nominations in the Northeast (17.4 percent) with women winning 40 of 232 nominations in the West (17.2 percent). The Midwest (22 of 211, 10.4 percent) and South (20 of 241, 8.3 percent) lag far behind. During this period, an average of 13.3 percent of major party gubernatorial nominees have been women, or 122 of 914. Hawaii leads the nation with women winning one-third of major party nominations for governor since 1986 (six of 18). Arizona (27.8 percent), Rhode Island (27.3 percent), and New Jersey (25.0 percent) round out the top of the leader board. The largest number of gubernatorial races women have won in a cycle is six – a record set back in 2006. That cycle, Alaska Republican Sarah Palin defeated Governor Frank Murkowski in her party’s primary en route to her win that autumn while five other incumbents also were victorious – Republicans Jodi Rell of Connecticut and Linda Lingle of Hawaii and Democrats Janet Napolitano of Arizona, Kathleen Sebelius of Kansas, and Jennifer Granholm of Michigan. The 2018 cycle seems poised to break that record as well. Governors Kay Ivey (AL), Kate Brown (OR), and Gina Raimondo (RI) are favored in November as are Democrats Gretchen Whitmer (MI) and Michelle Lujan Grisham (NM) and GOPer Kristi Noem (SD). Meanwhile, Republican Governor Kim Reynolds (IA), and Democrats Janet Mills (ME), Laura Kelly (KS), and Stacey Abrams (GA) are in toss-up or fairly competitive races. Despite the record number of women nominated for governor this cycle, there are no general election matchups between two women. This has occurred only three times in U.S. history: Nebraska’s Kay Orr vs. Helen Boosalis in 1986, Hawaii’s Linda Lingle vs. Mazie Hirono in 2002, and New Mexico’s Susana Martinez vs. Diane Denish in 2010. By contrast, women from two major parties have squared off in U.S. Senate races 22 times, including six times in 2018. Next: Will Kansas Elect A Democratic Governor in 2018? 2 Comments on "Which States Lead the Nation Nominating Women for Governor?" 1. Since 1986: Does CT not tie with AZ @ 27.8% (paragraph just prior to map)? RE #2. Agree – I would guess the percentage of women nominated for lieutenant governor (particularly running mates) might be equal to or more than men. I should look into that data. RE #1 CT corrected above, thanks (16.7%).